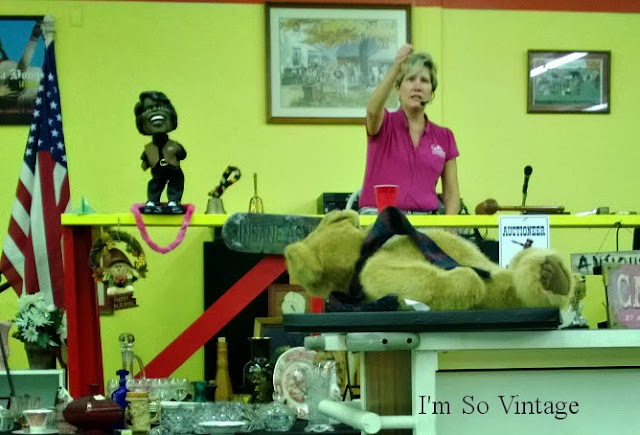 Yesterday was such an exciting day here at the I'm So Vintage household that it is hard to keep the momentum going. However, I did promise to let you know about my daughter's giveaway of her succulent. SO true to my word (and as we all know I have never fibbed a day in my life) you can click here for the giveaway. 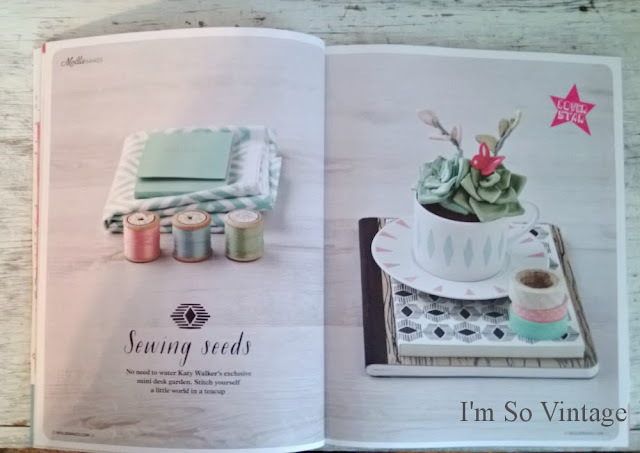 In case you missed my post about her magazine feature, and I don't know how you could have because I stood on the courthouse steps with a megaphone and announced it to the world, you can read about it here. Well, enough about her. Let's get onto my really exciting life. NOT!!! 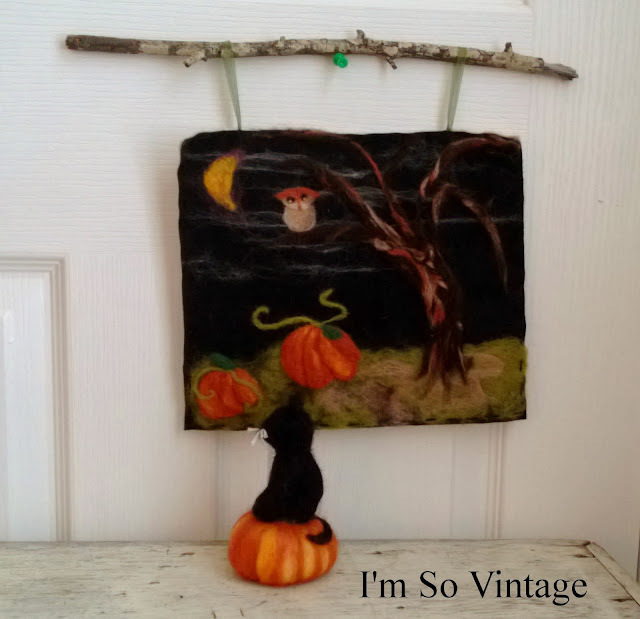 Sister informed me in her older sisterly sort of way, that I need to dispel the notion that I am not artsy or crafty, so I thought I would share a photo of some Halloween needle felting I did a few years ago. An original Halloween scene and a cat sitting on a pumpkin. If the sun would come out I could get some better photos. Fall means attending lots of auctions, and so that is what is taking up a lot of my time. Sometimes you have to sit for several hours, through a lot of junk, in order to bid on a couple of things. It can be very time consuming, but I love visiting with my friends (magazine of course was passed around for those who missed the courthouse thing) and I have come home with a few finds for my bedroom and bathroom this last week. 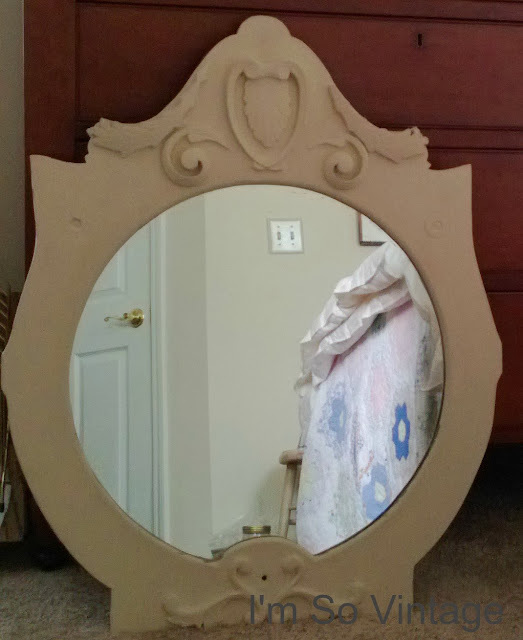 This large painted mirror was one of them. I'll probably hang it while I decide about repainting it at a later date. I'll also share some of my other finds and what I am doing with them in the weeks to come. I'm hoping the sun will make an appearance over the next couple of days so I can get out and take some pictures. I'm definitely not a gray and gloomy kind of girl. I love the mirror you found. Can't wait to see what you do with it. I bet going to auctions is fun. I love your mirror I could see lots of fun colors for her. Great score. I also love that mirror! Pretty mirror! You had me smiling about the courthouse steps....I am sorta the town crier when it comes to my kids accomplishments also! I want some sunshine so I can take some photos. Hopefully tomorrow. It's been overcast all day here too. Gloomy. No light slanting in the blinds. Yuk. Congrats for your daughter! Wow! Artsy, craftsy runs in the family..so nice! You girls got talent..
Beautiful mirror and I bet you're a lot more artsy than you think. Congrats to your beautiful daughter! Her succulents are just fabulous. Great buy at the action as well.